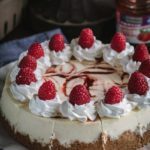 This Keto Raspberry Cheesecake Recipe will knock your socks off! It's a decadent keto dessert. Place all the ingredients for the cheesecake base in a mixing bowl and mix well. Place the cheesecake base into a lined pie dish. Press the base down with the back of a spoon or using parchment paper, press down gently. Bake at 180C/350F for 10 minutes, or until golden. Place all the ingredients in a mixing bowl. Using a stick blender, process with the blade attachment until lump free. You may also use a blender to do this step. Pour the cheesecake filling onto the cooked cheesecake base. Add the raspberry swirl (see below). Gently swirl the cheesecake filling and the raspberry puree together. Pulse/blend the berries and sweetener together using a stick blender. Pour HALF the raspberry puree over the cheesecake filling in large circles. Swirl together gently. Bake at 180C/350F for 20 minutes, or until cooked in the centre. Push a fork into the middle to test. Serve the raspberry swirl cheesecake with extra raspberry puree.